Even with all the inconveniences and hassles we’ve had so far in Egypt, I do have to admit their ancient ancestors built some magnificent monuments. 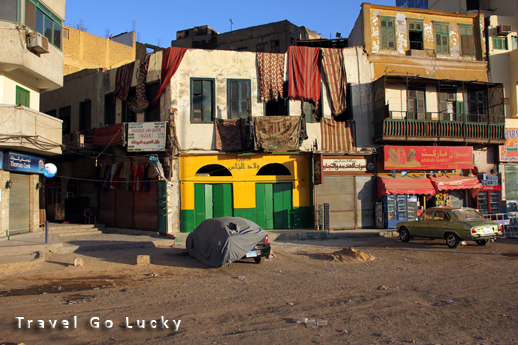 We took an overnight train from Cairo to Aswan, which is in the far southern region of Egypt. 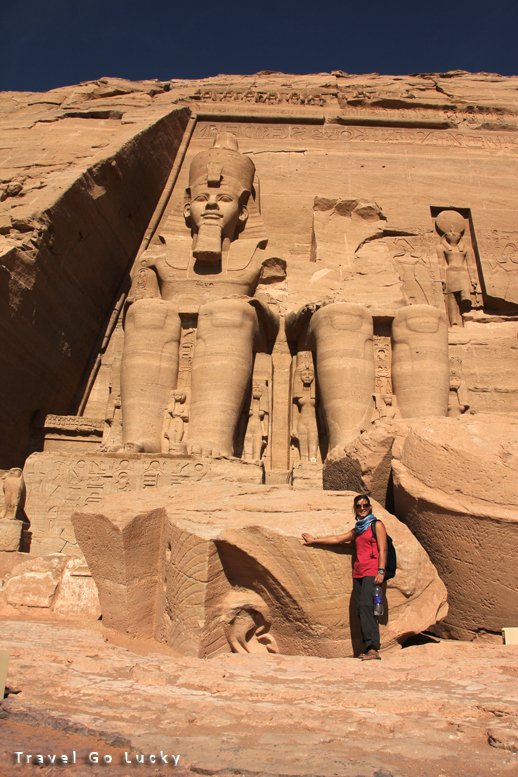 We woke up for a 3 AM, 3 hour bus ride to see Abu Simbel, a temple built by Ramesses II. Although the pyramids are the oldest and pretty massive, walking up to these temples was quite impressive. They are so well preserved, which really surprised me considering they date back to the 1300 BC! 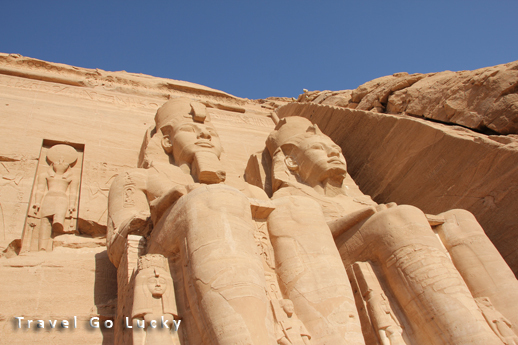 A fun little fact about the two temples we saw in Abu Simbel is that King Ramesses II had a temple built for his wife, Nefertari, but he made his Queen the same size as the King. This was a first in Egyptian history, showing much respect for his Queen by representing her as an equal to himself. Both Temples were relocated in 1964 nearby the original location on a man made hill because of the creation of the Aswan High Dam. The driver joked with us as we boarded our mini bus that we were only a couple miles from the Sudan border, and wondered if we’d like to stop and visit for a few hours. We laughed and told him we would prefer to stay in the relative safety of Egypt. Two days later we hopped on a train up to Luxor, to visit the Valley of Kings. The Valley of Kings is a valley where tombs were constructed for the Pharaohs and other powerful nobles of the New Kingdom of Egypt were buried. This is where King Tuts tombs was discovered, but as Adam said in an earlier post this tomb isn’t any different than any of the others now that all the “stuff” inside of it is at the Cairo museum. 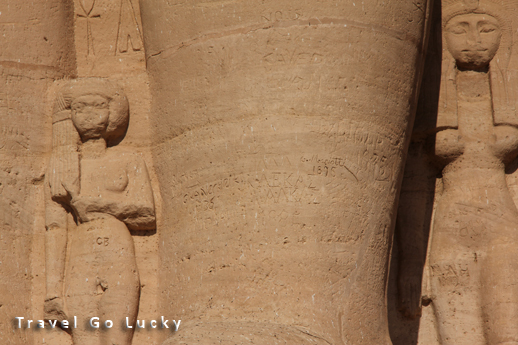 So we saw King Ramesses II, III & VI. A few of them were preserved incredibly well, with vivid colors painted on the walls from thousands of years ago. Unfortunately for you guys, there was no photography allowed. 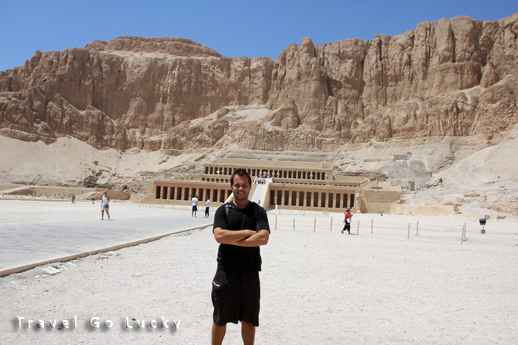 What is so crazy about the Valley of the Kings is that they are still finding tombs, the latest one was found in 2008. Most of the tombs once discovered are often empty, because tomb robbers emptied them many years ago.
. Last stop was the Temple of Hatshepsut, who was a female pharoah and some say was one of the most successful in ancient Egypt. This structure had significant restoration done to it, but it was massive. We definitely enjoyed this whirlwind tour of ancient Egyptian architecture, even though we weren’t experts on the subject matter. Adam and I really had to think back to our grade school social studies classes where we originally learned about this stuff. Our lack of knowledge on the temples didn’t take anything away from the incredible architecture and appreciation of structures that were thousands of years old. I'm sure no one within a thousand miles of here knows what the Green Bay Packers are! This entry was posted in Egypt and tagged Egypt. Bookmark the permalink.